My relationship is over. Although we haven’t officially sat down and discussed the details of how we’ll take care of our children and what our separation will look like, I know it’s over. For the past couple of months I’ve noticed the change in her behavior; how she barely looks at or speaks to me. We’ve stopped being intimate for more than six months so I’ve become used to sleeping on my side of the bed while she sleeps on her side, never coming into contact during the night. It’s funny how I used to take those nights for granted when I used to simply spoon her in my arms, listen to her breathe, and wipe her slobber off my arm several times throughout the night. Man, I miss those nights. Now it seems like she can barely stand the sight of me. She doesn’t have to say anything, I can tell what she’s thinking by looking in her eyes. I’ll never admit it to anyone, but I’ve spent several nights crying and asking God what went wrong with my relationship of six years. Like any relationship, we had our share of problems. I’d complain about her cooking skills, and she’d complain about my romantic skills. “You don’t romance me enough,” she’d whine from time to time. I told her that I’d work on myself and I thought I was. I guess I wasn’t changing fast enough for her. I used to know what she wanted in our relationship, but I don’t know anymore. It seems like I can’t give her enough no matter what I do. To be honest, I got tired of trying to please her. I guess I gave up, too. Watching my relationship deteriorate reminds me of how I sat by my father’s bedside day by day and watched him slowly die from cancer. There would be times when I thought he could turn it around and fight to stay alive. Then there were those days when I’d be afraid to leave the hospital because I didn’t want to be home when I got “that” phone call in the middle of the night. I feel the same way about my relationship. Sometimes I want to be the one to break the silence and just end it—pull the plug and watch those last precious breaths slowly escape never to return again. But I can’t find it in me to end it. For a while, I’d have this recurring dream of me carrying around a stillborn baby, refusing to bury it. I guess that was God’s way of showing me the reality of my relationship. It’s funny how going through such heartache draws you closer to God. I’ve been praying lately and I can honestly say that the man upstairs has been helping me to cope. I’ve come a long way in a few short months. I’ve finally accepted the fact that my relationship is dead and that I need to move on. I think I’m ready to have that conversation with my girl. I know it will be painful, but I know it’s what I have to do. I hope I don’t break down as I tell her what’s on my heart. 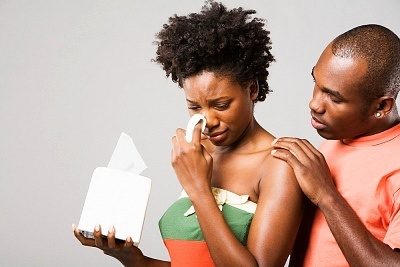 Most women don’t think men cry but we do. We hurt more than you’ll ever know. But we don’t always show it—not in the ways y’all think we should. Don’t get me wrong, we cry when we’re alone, but we tend to lash out instead of talking things out. We’ll say mean things that we know will hurt you instead of being straight up at times. I hate to say this, but I kind of wish my girl was one of those ghetto chicks that will cuss me out, slash my tires, and bust out my car windows because it would be easier for me to kick out her out of the crib, cut her off and throw up the deuces. But my girl has class and she’s not into that. I gotta handle this like a real man because I’m dealing with a real woman. I’m taking things one day at a time because God is helping me to deal with not being with her anymore. But I still need him to help me deal with not seeing my kids every morning. That really tears me up inside. I love those kids, even the one that ain’t mine. She doesn’t think I know about it, but I do—I always did. While we took a break for a few months a few years back, we both saw other people. I can’t look down upon her simply because she got caught out there because I had a scare myself. The shorty I was kicking it with got pregnant and I thought it was mine. But after the baby came we got a DNA test and I found out the baby wasn’t mine. I dodged a serious bullet on that one and I never told my girl. Starting over is going to be a beast. I have to find an apartment and get used to really sleeping alone. I know I’ll find somebody to smash with no problem, but I’m 34 now and I want something more. I want a family—like the one I had. I know I’ll get through it. I’m just hoping I get through it with the least amount of pain. This article really touched my heart. As you go through this transition remember if God brought you to it he will bring you through it. You say that you hope you can tell you girl without breaking down and telling her what’s in your heart. Well I feel maybe you should start there. You never know what the outcome will be. Continue to trust God maybe it’s not your relationship that is dead but how you deal with it. @Ant—I agree you should do something to make you happy. But what do you do when you have kids and other things that tie to you that person? I mean, you break up, but you still have to interact with them. There was a profound lack of communication in this relationship. Its no wonder that its dying. You know that its another’s child, yet you both didn’t address it–sounds like a cesspool of built up resentment no matter how much you love the child. If you didn’t talk about something so big, I’m imagining the little day to day things weren’t discussed either~another recipe for breakdowns. Also, how is she still just your girl with a few kids…not trying to be harsh, but just saying…if you all need to seperate, then fine, but there’s a lot to be learned here and it is probably salvageable with a great counselor that can teach real communication skills. Good Luck! @Cheryl—Ouch! You went there. I have to agree with you though. I know that other child has been eating away at him slowly, but surely. That is a major elephant in the room that nobody’s addressing. I guess he won’t marry her now that he knows she had a kid by another man. The funny thing is I think they can work this out, too. I really think he loves her and she loves him. This will take major counseling, a lot of love, and patience. I guess he was doing dirt, too because he stuck it out with her knowing about the kid. BTW, I truly believe that Love never dies. Its always there. Unfortunately, over the years, it gets covered up by unsaid communications and resentments and silent treatments etc. Its always a good idea to learn how to deal with stuff so those negatives don’t build up. So many people are so afraid of being vulnerable both men and women that instead of doing the necessary peeling away and laying your self bare, we get scared and protect ourselves fearing hurt and pain. I promise you being vulnerable in a real relationship will actually get you the result you need vs. being hard and protective and not letting your partner in. @Cheryl—PREACH! You’re right. You have to be vulnerable in relationships of all kind if you really want to feel their true essence. I’m learning to feel what I’m feeling meaning let my feelings take their course and keep it moving. I find that when I do this, I feel the pain as it courses through me, but after a while it’s over. I usually have a better understanding of the situation and I feel so much better. If I feel stupid, mad, sad, hurt, angry, betrayed, etc. I feel it and try to understand it instead of running away from it. It doesn’t always feel good initially, but I survive and when it’s over, I’m usually like, it wasn’t so bad. But I feel so true to myself and that’s important to me. Thanks for that comment, Cheryl! thanks Shalena, but I see this so often that it makes me want to scream. Women will talk to their friends and be real, men may either talk too or keep it in or act out, but they won’t talk to each other and be real. My mother even does it! I’m like, can you talk to Daddy, please…LOL or people are all about ‘winning’ an argument or proving their position vs. elevating the relationship. Its sad that we never realize that we don’t all necessarily know how to do a relationship because we are just modeling what we see (usually dysfunctional ones) and that there are courses and books out there that can help…A LOT! anyway, just some things I’ve learned. I would leave! You left the first time for a reason!! Now you have a bigger problem and two more people to add to yall problems…Just to much best to just keep moving!! WoW. I love this story. And I love this site. I’m going to leave now before I find myself on it all night. IF MY LADY GOT PREGNANT WHILE WE WERE BROKEN UP…HMMM….THATS BIG..NO HUGE…A SERIOUS CONVERSATION AS FAR AS IF THE BABY DADDY IS IN THE PICTURE AT ALL..& IF HE IS MAKE SURE HE PAYS CHILD SUPPORT….MAKE SURE SHE HAS NO FEELING FOR HIM IF SHE WANTS YOU….AND IF SHE GOT PREGNANT THAT MEANS NO CONDOM WAS USED TAKE HER TO THE CLINIC (REAL TALK)…. MAKE SURE THIS OTHER DUDE WONT BE AN ISSUE IF U R GONNA BE BACK WITH THIS “LADY”…. @Roger it’s finny that you say that about breaking up with her first because most men ALWAYS break up with women first and leave us feeling worst than the Cleveland Cavaliers on Kenton’s decision day. I guess that’s why y’all break up with us first. Y’all can’t handle the heartache. It hurts at the time shalena. She takes a bit of your control when she does that and a man always has to feel in control of any situation he finds himself in, no matter what. find the peace and joy that God has promised all of us. @All, I think it was more like they broke up and she went back to an old friend for comfort and support and things happened.